Over the past three months I’ve been experimenting with different deep moisturizing hair masques. NOTE: Descending order; most recently tested at bottom. Listed prices are for pot-sized products. Macadamia Deep Repair Masque reconstructs dry, damaged hair. This treatment improves elasticity and shine with conditioning benefits. This masque contains a combination of macadamia oil and argan oil, along with tea tree oil, chamomile oil, aloe and algae extracts which rejuvenate and rebuild your hair. Because this is an intense treatment, it shouldn’t be used more than twice a week. Fun fact: Moroccan argan oil is produced naturally from kernels that grow on the argan tree, which grows naturally in Morocco. They are used for a large range of health and beauty purposes primarily because of the abundance of medicinal, nutritional and cosmetic properties. Chemical treatments such as coloring and processing have been proven to damage your hair and scalp when repeated over time. 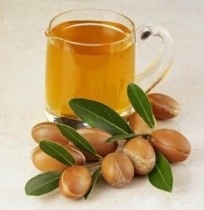 Argan oil strengthens your hair follicles from root to tip by deeply penetrating the shaft of each strand. Liberally comb through clean, wet hair and allow up to 7 minutes of penetration before rinsing. No heat necessary. This is a great beginner’s hair mask! The scent in this masque is very happy, and it contains lighter, more natural, and almost floral notes. Argan oil has a distinctive smell in hair products and Macadamia does an excellent job of masking it. I felt that although it did conditioned my hair and visually improved its health, it seemed to not hold in moisturization as well as other masks I’ve used since. This masque provided my hair an initial boost to prepare it for other conditioning treatments. This hydrating mask gives you the biggest bang for your buck! It’s strongly enhanced by the benefits of pure Moroccan Argan Oil, with the classic scent of argan oil. This is an extremely creamy rich conditioning treatment that revives dry, damaged hair. It productively works to restore the natural balance of moisture and elasticity for shinier, more manageable hair. It also helps to restructure hair’s protective film to shield from damage, leaving hair with a healthy look and feel. I received immediate benefits after just my first use! My hair was instantly shinier and appeared to have more depth. It also felt considerably softer. I also noticed that when I blew dry my hair, it was much more manageable; i.e. less frizz, flyaways, etc. Because argan oil is the primary ingredient in this mask, it helps to soothe your scalp, preventing excess dryness, itching or irritation. Texas has very little moisture in the air and consequently, our skin on our face and scalp is prone to being dry and less elastic. During winter months, my scalp is considerably more dry with extreme flaking and this is a great product that’s cured that problem. If you’re looking for a reasonably priced conditioning treatment with awesome benefits, I highly recommend this mask. Due to the great price, I go through a pot of this stuff within a month or so. I use it every other day on the days that I’m not shampooing my hair. I also make sure to use fairly warm water to open the pores in my scalp and to expose my hair follicle prior to application. I completely strain my hair of almost all water before I run this through it. The light creamy texture isn’t thick and pasty so I apply it generously to make sure I’ve gotten everything covered. I generally recommend this mask to my girlfriends the most because of its affordable price. Caviar Anti-Aging Replenishing Moisture Masque is an intense moisturizing treatment that infuses hair with hydrating moisture and aids every strand in retaining this moisture, improving smoothness and manageability. Hair is left silky, shiny and youthfully restored. Normally if I don’t blow dry my hair, I have annoying waves to deal with. After use of Alterna’s moisturizing masque, my hair is flexible, smooth and straight. This is a prestige brand product and you definitely receive salon quality results! The scent of this masque is Alterna Caviar’s classic smell; almost citrus like, it’s light and isn’t overpowering, and doesn’t smell cheap. *HydraComplex: An ultra-moisturizing ingredient blend that binds to water to infuse strands with intense hydration. Locks in water & other essential nutrients to maintain moisture levels. *Seasilk®: A unique blend of marine botanicals that provides exceptional moisture. *Age-Control Complex®: Addresses natural, chemical & environmental aging. Infused with Caviar Extract, Vitamin C & Cytokines to help smooth the hair shaft & increase shine. *Color Hold®: Proprietary technology locks in hair color brightness. *Enzymetherapy®: A core Alterna technology found in each of their products. It helps to transform ingredients into a micro-structure that the hair can more easily absorb allowing for deeper, more targeted penetration of active ingredients. After cleansing hair, remove excess water and apply to clean, damp hair. Leave on for 3 minutes. Rinse well. For best results, use 1-2 times per week. I use this moisturizing masque on every other occasion that I shampoo my hair. Like I’ve mentioned in previous posts, I keep my hair on an AB[CB] schedule. ‘A’ days, I shampoo and condition my hair and follow up with styling products and blow dry. ‘B’ days consist of thoroughly rinsing my hair and deep conditioning with One ‘n Only Argan Oil Hydrating Mask. Finally, ‘C’ days are the days I shampoo and deep condition with Alterna Caviar Anti- Aging Moisture Masque. Of the three masques, I enjoy Alterna’s moisturizing masque the most. However if you don’t have $40+ to spend on occasion, I would definitely look into One n’ Only. Keep in mind, I have fine, damaged hair. What may not work for me, or be my favorite, could be the only solution for someone else.